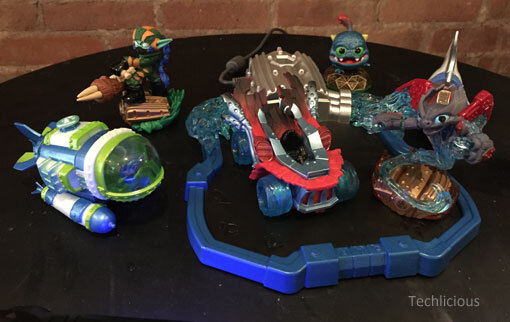 For the fifth edition of Skylanders, Skylanders SuperChargers, the creative minds at Activision have yet again come up with a fun new way to enjoy the mythical realm of Skylands with the addition of vehicles–cars, submarines, helicopters, tanks, jets. Now you'll not only be able to port your action figure into the game, but you'll also be able to send a vehicle along with it. In SuperChargers, the super vilian Kaos has escaped and has a new weapon ready to threaten Skylands, the Doomstation of Ultimate Doomstruction. Your task to race through Skylands in supercharged vehicles to stop him. Get ready to skid and drift in your land-based vehicle, race down rapids and surf waves in your watercraft and dogfight in your aircraft (Be sure to check out the video below to see game being played.). There will be 20 vehicles in all plus 20 new Skylanders SuperChargers characters. SuperCharger characters have special abilities to modify their unique vehicle to give it special abilities, but you'll be able to use any Skylanders character in the game, going back to the original Skylanders. And, all vehicles can be upgraded in the game with a separate set of modifications without pairing a SuperCharger character. Skylanders SuperChargers is available for PS3, PS4, Xbox 360, Xbox One, Nintendo Wii and iPad. A starter pack with one vehicle and two characters costs $74.99 on Amazon with individual vehicles costing $14.96 on Amazon and characters costing $12.96 on Amazon. 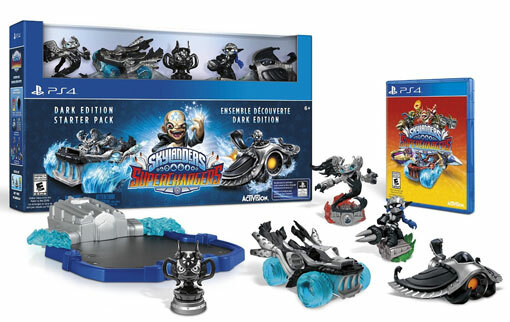 A special dark edition, which includes 2 Skylanders Super Chargers Characters, 2 Skylanders vehicles and 1 Kaos Trophy costs $99.96 on Amazon.